The Seahawks' second-year tight end endured an up-and-down college career as a dual-threat quarterback at Texas. 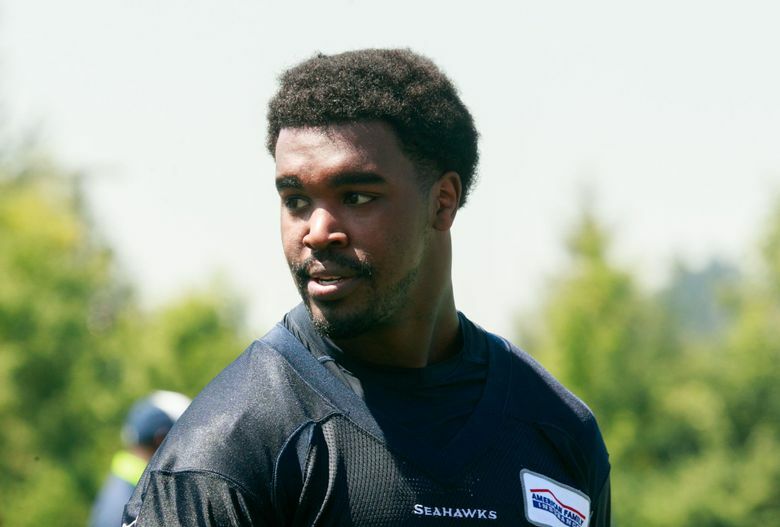 How did those struggles actually help Swoopes reinvent himself in Seattle? Tyrone Swoopes was serenaded with each passing step. On Thursday morning, during the first practice of training camp, the unlikely second-year Seahawk hauled in a pass from Russell Wilson, turned and started running. As he did, the stereo system surrounding the VMAC practice fields pumped out a familiar chorus, five words and a funky beat serving as an accidentally appropriate soundtrack. The player was a tight end. That, most likely, would make you a fan of Texas football. Because, from 2013 to 2016, Swoopes was a high-profile scholarship quarterback for the mighty Texas Longhorns. And before that, he was a standout signal caller at Whitewright (Texas) High School, a U.S. Army All-American and a consensus four-star recruit. Besides three games in his freshman season at Whitewright, when he played wide receiver until he broke a bone in his arm, Swoopes has been a quarterback. And a physically imposing athlete. “He was really, really athletic,” Mack Brown, who won a national championship at Texas in 2006 and recruited Swoopes, said Friday. “We had him in camp. He played at a really small high school, so he wasn’t polished at all. It turns out, that “something” wasn’t what most Texas fans expected. In 40 career games, Swoopes made just 14 starts at quarterback, accumulating a 6-8 record and completing 56 percent of his passes. It didn’t help that he played for five offensive coordinators in four seasons in Austin, Texas, the annual recipient of a fresh philosophy and an unfamiliar offensive scheme. “You don’t have a lot of guys (at quarterback) that are as big and strong and powerful as he is,” said Brown, who resigned following the 2013 season and works as an analyst for ESPN. “I wish he had not had so many different offensive coordinators, because he was a very good passer as a young player. He may not be playing quarterback, but at least Swoopes is still playing — and running. The 6-foot-4, 254-pound athlete did a lot of that at Texas, notching 966 career rushing yards and 24 rushing touchdowns. He even earned his own short-yardage rushing package in his senior season, affectionately dubbed “18-wheeler” for No. 18. At the end of his senior season, Swoopes’ agent convinced the Longhorn alum to try tight end. He went undrafted and signed with the Seahawks in May 2017. In retrospect, it’s undeniable that Swoopes’ four years at Texas didn’t prepare him physically for a professional future at a different position. But struggling at that position, at that school, under that searing national spotlight, did allow him to conquer significant adversity for the first time in his life. “People watched you being recruited for two or three years, so they follow you and they put you up on such a pedestal that unless you win 12, 13, 14 games (per year) then you haven’t been the successful quarterback that they all thought you could be,” Brown said. Like, for instance, the uncertainty of a new position — and a season on the Seahawks’ practice squad. “At first (the scrutiny did get to me), but I had a lot of people close to me — my parents, a couple of my strength and conditioning coaches,” Swoopes said after the first practice of training camp on Thursday. “They always stayed in my ear, told me to stay encouraged and encourage others. Swoopes has sat before. He’s struggled before. But on Dec. 31, 2017, he encountered a first. The new-look rookie tight end was signed to Seattle’s 53-man roster for the team’s regular-season finale against Arizona. He even got into the game. In training camp, all Swoopes has to do is compete with fellow Seahawk tight ends Ed Dickson, Nick Vannett, Will Dissly, Clayton Wilson, Kayaune Ross, Je’Ron Hamm and Kyle Carter. With Dickson (who started training camp on the non-football injury list with a groin injury), Vannett and Dissly (the team’s 2017 fourth-round draft pick and ex-Husky) likely to make the roster, he has to take advantage of every available rep. He has to be an 18-wheeler (even if his new number is 46). Pete Carroll and Co. will be watching. He has to make them believe. “So he was totally tuned into it. He had a great offseason. He’s athletic. He’s physical. He’s not just a run-and-catch guy like you might think, because he’s a (former) QB. He’s got enough physicality to play on the line of scrimmage and block people.